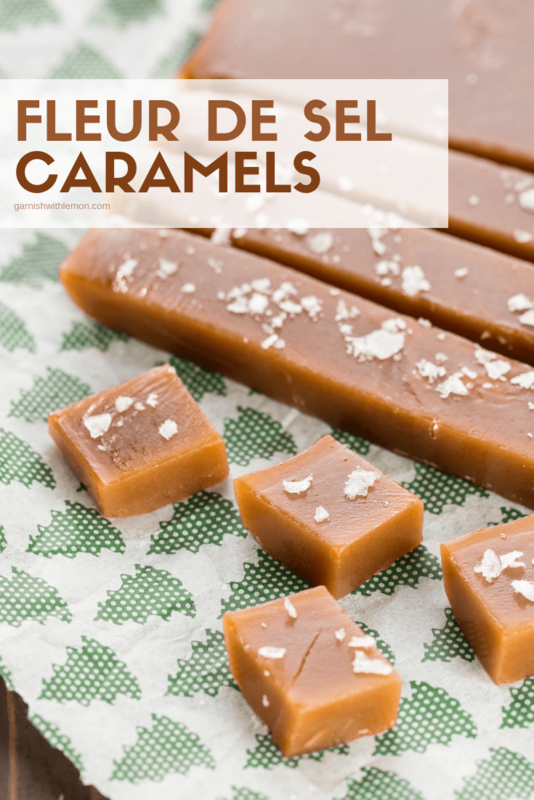 Nothing says the holidays are here like a batch of homemade Fleur de Sel Caramels. And they are so easy to make, you’ll never buy them again! I love holiday baking – the cookies, the cakes, the bars, all of it – but making candy used to scare me. A couple of years ago, I decided to tackle my fear and take a stab at it. 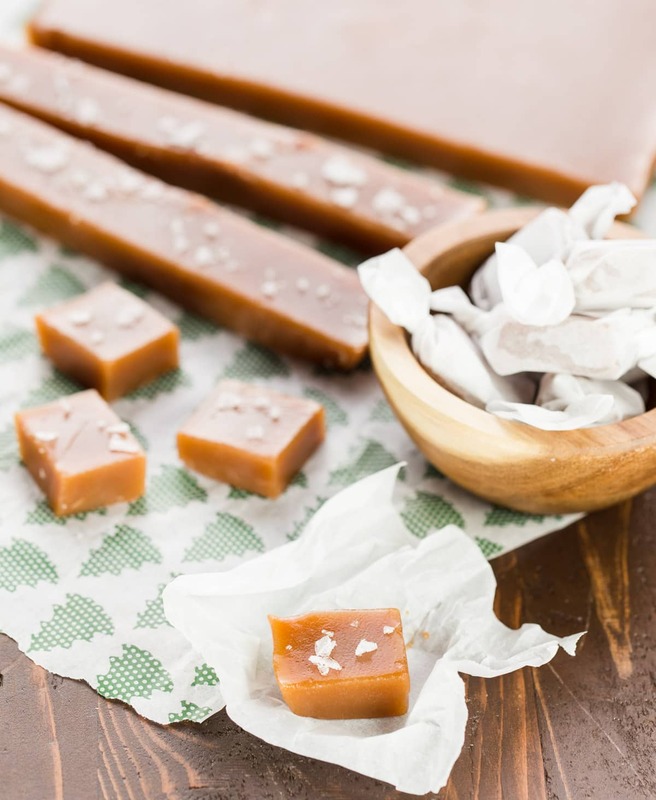 I searched the internet and read dozens of candy recipes before settling on Fleur de Sel Caramels from Ina Garten. I love Ina’s recipes. They are always solid, don’t have a ton of ingredients, and her instructions are direct and clear. I knew that if I was going to be successful at making candy, Ina would help me do it. I love salt and I love caramel so what could be better than the two together? 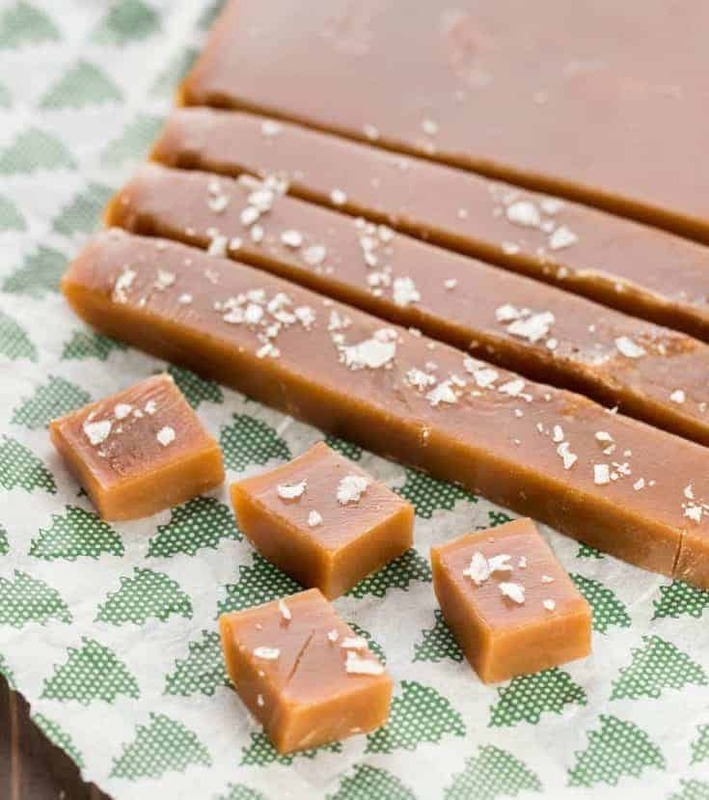 The caramels are relatively easy to make, but you’re going to need a candy thermometer for accurate results. If you remove the caramel from the heat too soon, the candy won’t set. If you leave it on too long, you’ll send your friends to the dentist. These got rave reviews when I gave them as gifts last year. Wrapping the caramels individually is so much fun, too, and the kids love to help (especially since I let them sample one or two as we work). These disappear quickly, so make a double batch to have some left for Santa. He really likes them, too. In a deep saucepan, combine 1/4 cup water, the sugar and corn syrup and bring to a boil over medium-high heat. Boil until the mixture is a warm golden brown (about 10 minutes.) Don't stir -- just swirl the pan. Watch closely as it will turn burn quickly once it starts to turn brown. In the meantime, bring the cream, butter and 1 teaspoon of fleur de sel to a simmer in a small pot over medium heat. Turn off the heat and set aside. When the sugar mixture is done, turn off the heat, attach your candy thermometer to the pot and slowly add the cream mixture to the sugar mixture. Be careful -- it will bubble up. Stir in the vanilla with a wooden spoon and cook over medium-low heat for about 10 minutes. Take it off heat when the mixture reaches 248 degrees F (firm ball) on a candy thermometer. Very carefully (it's hot!) pour the caramel into the prepared pan and refrigerate for a few hours until firm. When the caramel is cold, pry the sheet from the pan onto a cutting board. Cut the square into pieces and sprinkle with fleur de sel. Wrap in 4 by 5 inch pieces of parchment paper and refrigerate. Serve well chilled. I love caramels and generally whip up a batch yearly. Your photos are beautiful–it looks like it’s that caramel time of year again! Thanks, Vespa! Isn’t it a fun time of year? I love caramels too. These are just what I am looking to make for the holidays! Can you tell me where you found the cute paper to wrap them? Thank you! Hi Kathryn, I found it at World Market. They had green striped paper too. Isn’t it fun? I was so excited when I found it! I was wondering how long these caramels last ? I wanted to make them in advance for a wedding. I have kept them in my freezer for 2 months, but I have read that they keep up to 6 months if there are properly wrapped. Let me know what you decide! Good Luck! These are so simple and look simply divine! As for freezing, I don’t think there is any way they would last 6 months in my freezer if I knew they were there – would be gone in a few days! Good point! They never last that long in mine! This sounds amazing! How long do you think they’ll last out of the freezer? Thanks!! They don’t last long in my house! But I store them in the refrigerator until serving!